School principals say switching to board exam format is reason; State students fail to make it to All-India top three. 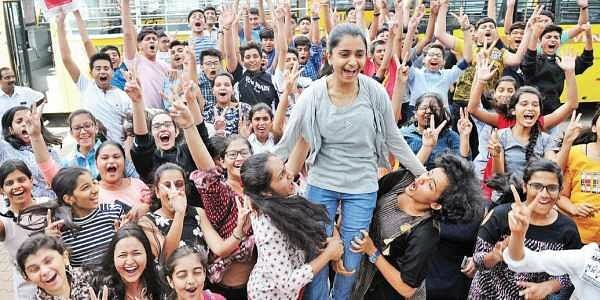 BENGALURU: The Class 10 results of Central Board for Secondary Education (CBSE), 2018 were out on Tuesday afternoon and no student from Karnataka made it to the top three positions at all-India level. As per the data released by CBSE, over 25 students shared the top three positions at all India level where four students shared the first place with a score of 499, the second position is shared by seven students who scored 498 and 14 students shared the third position by securing 497 marks. Prakhar Mittal of DPS Gurgaon, Rimzhim Agarwal of RP Public School Bijnor, Nandini Garg of Scottish International School Shamli and Sreelakshmi G of Bhavan’s Vidyalaya Cochin share the first rank. The overall pass percentage has dipped this year by 3.35%. This year, the overall pass percentage is 86.70 as against last year’s 90.05. But the Principals of several CBSE schools in the city feel it is because of the switch over from the Centre for Continuing Education pattern (CCE) to board exams. “From the last nine years, the scoring format was CGPA (Cumulative Grade Point Average) and it was CCE pattern at schools. From this year, this has been discontinued and board exams were made mandatory. This has affected the performance of students,” said a principal of one of the top CBSE schools in the city. As many as 16,24,682 candidates appeared for the Class 10 CBSE 2018 exams across the nation, of which 14,08,594 have cleared the exam. The examination was conducted between March 5 to April 4 at 4,460 exam centres across the nation.